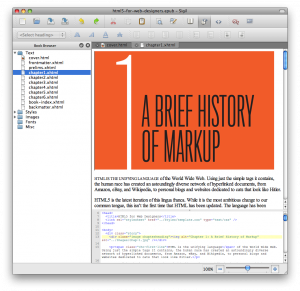 At the beginning of the year, I bought an ebook in PDF format, and wrote a post about my adventures trying to get the layout to STAY THE SAME on my Mac. Today I bought a book in ePUB, by the subject of my most recent post, Jeremy Keith. The book is published by one of my favorite websites, A List Apart, and it's their first venture into publishing. 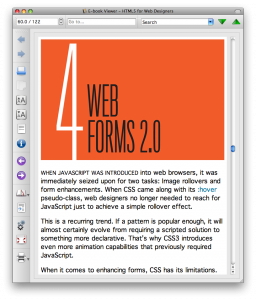 Check out Jeremy Keith's HTML5 for Web Designers at A Book Apart, featuring a foreword by Jeffery Zeldman. It turns out that many of the programs I liked for opening PDF eBooks are all wrong for ePUB versions... ugh. Also, as before, it seems like several of the programs want to convert these books to some other format. What if I just want to read the thing? I've done a little research, and found a few links. It turns out Sigil is not meant to read ePUB at all, but create it. It's quite a lot like Dreamweaver or Coda, with a code view and a WYSIWYG editor preview, which so far works pretty well for reading. What it revealed to me is that ePUB looks a lot like a zipped HTML file on the inside, complete with CSS and images. Useful, but not what I asked for. Then Google turned up the desktop Sony Reader. I danced past this one because I assumed it was for people who owned the book reader of the same name. Sony Reader is the first electronic paper reader I know of, but it turns out you don't have to have one in order to use this software. This program requires a restart to install, which I was not prepared to do - I'm in the middle of a blog post here! Caveat emptor. Next up was Adobe Digital Editions. I'm generally untrusting of anything resembling "reader" that comes from Adobe, because PDF has notorious security holes. For all I know, this is an AIR app, but I'm not sure. The "reading view" seems to work fine, but even on this small 60-page book, I can only scroll in a "page down" fashion, there is no smooth scrolling. This app also asked me activate with Adobe's service, something I really don't need. 2 out of 5, nothing special. For a review of Stanza, see my previous post. 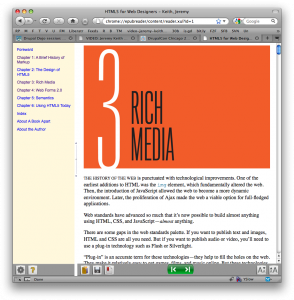 A promising development was the ePUB Reader extension for Firefox. I normally use Camino, though I wish they would update the underlying rendering engine, and I normally just use Firefox for "work" because I have lots of extensions installed. 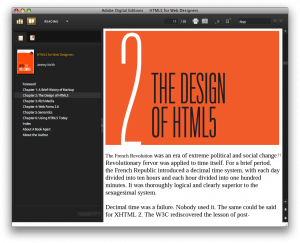 Reading this HTML5 book counts as "work", so this extension seems to make sense for now. It does do smooth scrolling, and I was able to open the file just by dragging it to Firefox, something that didn't work previously, despite ePUB's HTML-ishness. This also has a "Library" view, and support for bookmarks, so I don't really see it as missing anything. So far, none of the tools I've tried have attempted to majorly re-format the book. The world is a happy place. The award for least intuitive website includes Calibre as a finalist. The other readers weren't far behind. Also open source and cross-platform like Sigil, this program made it hard to discover that it did indeed open ePUB files for reading. They go on and on about all the different formats for conversion, similar to the 1990s Mac favorite Graphic Converter, but I wasn't sure if it was a decent reader. Once i figured out how to open a book for reading, I found the navigation unintuitive and clunky. The interface really seems geared toward converting and managing the books more than reading them. If that's what you need, I think this program would be pretty great. Once I came across FBReader, I stopped. While I am no stranger to code and experimental computer programs, I really wasn't looking forward to taking risks to read a book. I wish the developer the best of luck. There also appeared to be some readers that worked over the internet, but I tend to see one of the advantages of books to be their on-demand nature. I should be able to read from an airplane, train or during a power outage. I do live in hurricane country, after all. I hope this little list has helped I think I will end up using the Firefox Extension, when all is said and done. One day, I may just go for a Kindle , but for now I will keep my digital book reading on my laptop. Credit must be given to the people who wrote this post on epub readers, which was useful in realizing that some of the tools I was passing by actually were meant to be used for this purpose.